Utilizing the original design of John Madison Taylor M.D., MDF® Instruments has modified the Taylor Hammer to incorporate modern design and functionality for eliciting myotatic and plantar response with less effort and greater patient comfort. Head: Thermo-plastic-rubber triangular head has beveled apex and base employed to elicit myotatic reflex. The soft base and rounded apex is perfectly suited in provoking myotatic responses in striking precise location of tendons. Also suited to obtain chest sounds and to percuss the abdomen. Handle: The weighted chrome-plated Zinc Alloy handle is precisely balanced for increased control of force in the percussion. The encircling band of handle with pin firmly secures the triangular head midway between the apex and base. 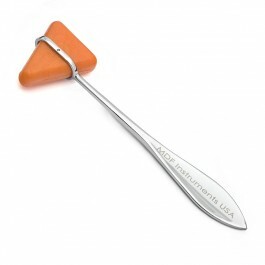 The handle is also designed with a pointed tip for eliciting cutaneous and plantar reflexes.